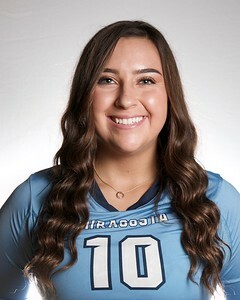 Women's Volleyball Player Selected as "Star of the Month"
Congratulations to MiraCosta College student Hayley Torres, a November 2018 selection for the San Diego Sports Association, Stars of the Month. Torres is an outside hitter/defensive specialist on the Spartans women's 2018 volleyball roster. With Torres leading the way, MiraCosta collected three top 25 wins and captured the Pacific Coast Athletic Conference with a 9–1 record. Torres was credited with 58 kills on a .326 hitting percentage. She added 34 digs and seven blocks for the Spartans. Each month, the San Diego Sports Association honors professional, amateur, and prep athletes as "Stars of the Month" for their outstanding athletic accomplishments. This exclusive honor has been bestowed by the San Diego Sports Association (formerly the Hall of Champions) since 1946 to recognize only the highest performing local athletes. Stars of the Month are recognized in the San Diego Union Tribune, via the Fowler Family Awards Center at Petco Park, on the sports association's social media channels and website, and at San Diego's premier sports awards gala, Salute to the Champions. They also receive a Breitbard Certificate of Athletic Achievement.